Hawthorn is the premier herb for treating the heart and may be taken as a tincture or as a decoction from the dried berries. The delicious fresh berries may be eaten in season to fortify the heart, possibly the mildest way to use the herb. Working dogs and those who are subject to physiological stress benefit from hawthorn as a daily supplement, as do older animals who suffer from chronic heart problems. Recipe Instructions: Decoction :Crushing the berries makes it easier to extract the active principles. Combine 2 teaspoons of dried berries to each cup of cold water in a covered saucespan. Bring to a boil over a low heat, simmer for 10 minutes. Let steep until cool enough to drink. 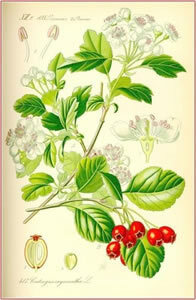 Hawthorn syrup may be made by combining 1 part strong berry decoction to 2 parts honey.